In what appears to be the latest episode in a reality TV drama, Val "Young Bull" Cuffy has left the bullring. Again. And this one came with more drama, more suspense, more controversy than previous episodes. In a surprising and dramatic twist, Cuffy quit as festivals and events manager of the Dominica Festivals Committee (DFC) after only six to seven months into a two-year contract, over the banning of eight-time calypso monarch, Dice, from performing at the recent street festival in Roseau to formally launch this year's carnival. No one but Cuffy appeared willing to speak on the issue - Colin Piper, chief executive officer of Discover Dominica Authority (DDA), the statutory body that oversees the DFC, told The Sun he would not comment because "you call me once a year, when there is a controversy and promise me a balanced story and I never see the balance in the story", while minister of tourism, Robert Tonge, who has direct responsibly for the DDA, politely declined comment. Attempts to reach Benoit Bardouille, the DDA chairman and one of the people at the centre of the controversy, proved unsuccessful. However, Bull has been speaking – for example, he gave an extended, brutally honest interview to the state owned DBS Radio – and the snort of derision and indignation is evident. Cuffy told The Sun that having decided to invite Dice to the low-key opening, he was ordered by Piper to withdraw the invitation because Dice's song, "Lootahs", was "inappropriate". "Colin said to me whoever gave him the orders told him the song is inappropriate, it is not fit to be played. So I asked him, what is wrong with the song. Colin said 'you have to look at the socio, economic and the political considerations before you can put Dice on stage'. And that is the analysis they use," he said incredulously. "So I didn't use the proper criteria. I only used the socio and the economic, I didn't use the political." Having signed the letter advising Dice of his fate, a rueful Cuffy resigned, giving the DDA the one-month notice specified in his contract. Not long after, he was asked to leave immediately, ending all involvement in the event he had begun to plan. It was precisely because he was deeply involved in the planning of carnival, Cuffy explained, that he proceeded to sign the letter instead of refusing to sign and quitting immediately. "I would never have done that. I could not have mashed up the opening on Friday by quitting and not having the opening done. Neither Dice, not me, is bigger than the opening, is bigger than carnival. So I had to do it, get the opening done, then quit on principle. Everybody knew I didn't agree, including Dice." The Bull has been in this barn before, this being the third time he is either quitting, or being fired from, the festival organising committee in ten years. Back in 2008, after two years on the job as executive director of what was then the Dominica Festivals Commission, Cuffy had been sent packing in a rather unceremonious manner when the permanent secretary "called Val into her office and told him to pack his bag because Cabinet has decided he was to go", a source told The Sun at the time. He has now revealed to The Sun that the reason for that firing was because "I refused to give Labour Party a bar, Ambrose George fired me, albeit for a few hours". 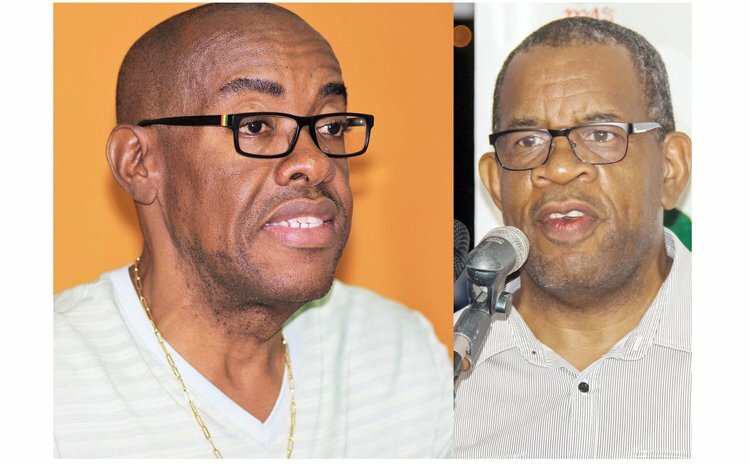 Back in April 2010, he resigned, ending a rather tempestuous relationship with the DFC, but was again asked to return after seemingly reconciling his differences with Piper, who never questioned Cuffy's competence. "As somebody who led the DFC for three to four years, he certainly was competent to do the job," Piper had told The Sun after Bull had been reengaged for carnival last year. Asked if all of this back and forth did not suggest a character flaw on his part, Bull was adamant that the problem began and ended on the other side. "A character flaw on who? Can you say my stint as director hasn't been the most successful one? It's because of the [interference] that I leave. Why do you think they keep calling me back? It's not because they love me. The system is the one that is flawed," he said. "It might look like I am the problem, but a man doesn't leave three times unless you call him back three times. And there's a reason they keep calling me back." Cuffy points an accusing finger at Bardouille, holding him responsible for the alleged interference that Bull dislikes so much. "If I had to hire a plumber, Mr. Bardouille had to approve. If I had to hire cleaners for the park, it had to go to Mr. Bardouille," he said. It was classic Bull. Fierce, ferocious, furious, It was proof that neither time, nor twine, has tamed the raging bull.